You've seen them at fairs, you've seen them at home shows. You've seen them on television, at specialty stores, in hotels and restaurants. Now you can see them and even BUY them on the Internet! Presenting the Ameriware Professional non-stick cookware system! Millions of cooks at state fairs across America have built in their wish list to create the world's finest and most durable non-stick ever. At last, American made commercial grade cookware for home use.The Ameriware Professional line features the non-stick system Pro-Series PLUS Ti-2®. Pro-Series PLUS Ti-2® is a 3-layer non-stick system internally reinforced with ceramic and titanium approved for use with metal utensils. Pro-Series PLUS Ti-2® is the strongest, most durable non-stick system on the market and comes with a 25 year warranty. 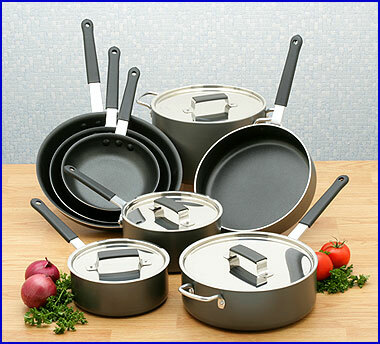 You can now see and purchase this fine cookware right here on our Web site! • Finally real commercial cookware For Home Use! • NSF Certified "the standard requirement for all commercial cookware"
• "Pro-Series Plus Ti-2®" This revolutionary new 3-layer system is internally reinforced with ceramic and titanium. It is the most durable non-stick system available today. It is tougher then any other non-stick system period! • Completely nonstick inside and out! Cook without fats, oils or grease, saving money, calories and time! • Approved for use with metal utensils. • Completely ovenproof for baking. You're not just getting stove top cookware, its bake ware as well! • Dishwasher safe (commercial dishwashers okay)! • Triple riveted "never loosen" heavy gauge, commercial nickel-plated handles for durability.